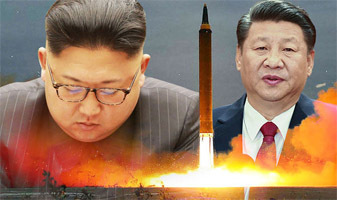 The Express of the United Kingdom is reporting today that North Korea has been warned by China not to detonate another hydrogen bomb at its nuclear test site or risk a huge catastrophe. Scientists from Beijing believe the Punggye-ri nuclear facility is unstable and that just one more explosion could blow the top off of Mount Mantap, beneath which all six of North Korea’s nuclear tests have been conducted. Celebrated its sixth nuclear test in September. Researchers from the Chinese Academy of Sciences’ Institute of Geology and Geophysics warned Pyongyang delegates of the risk during a briefing in Beijing soon after North Korea’s last nuclear test on September 3, according ot the South China Morning Post. The meeting was held two days before North Korean Foreign Minister Ri Yong-ho told reporters at the United Nations Assembly that Pyongyang was considering conducting a hydrogen bomb test over the Pacific Ocean. Zhai Mingguo, a senior Chinese geologist who organized the September 20 briefing, told the newspaper: “This is a big, sophisticated problem requiring multiple, systematic approaches. 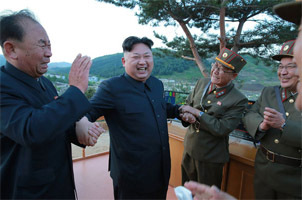 Relations between North Korea and China, the rogue state’s only ally, have become strained amidst Kim Jong-un’s obsessive if not insane pursuit of nuclear weapons and direct threats to the United States of America. 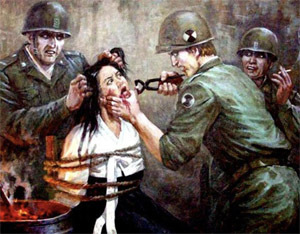 Click here for more including video and images of propaganda art of North Korea depicting war crimes by American troops. As criminal communists, North Korea lies and frequently accuses others of crimes they commit. There is no direct confirmation this image was inspired by North Korea’s treatment of the young American student Otto Warmbier. As President Donald Trump said in his address to the UN General Assembly, “No one has shown more contempt for other nations and for the wellbeing of their own people than the depraved regime in North Korea. It is responsible for the starvation deaths of millions of North Koreans, and for the imprisonment, torture, killing, and oppression of countless more. 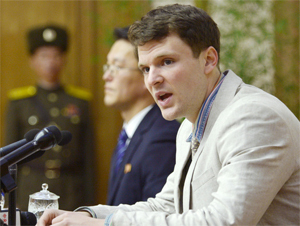 “We were all witness to the regime’s deadly abuse when an innocent American college student, Otto Warmbier, was returned to America only to die a few days later. We saw it in the assassination of the dictator’s brother using banned nerve agents in an international airport. “We know it kidnapped a sweet 13-year-old Japanese girl from a beach in her own country to enslave her as a language tutor for North Korea’s spies,” President Trump added. For more of President Trump’s UN speech September 20, click here. This entry was posted in National on October 30, 2017 by admin.